I was born in an era of steam railways, but this era was soon to come to an end, and when I reached my teenage years, steam was rapidly being replaced by diesel. My favourite form of diesel engine was the diesel multiple unit, or DMU. I fondly recall riding through the Peak District in a DMU on the Sheffield to Manchester line. A specially staged photoshoot in the rain at Shuttle. Back in November 2013, I was lucky enough to win a competition to drive a DMU, and a diesel, along the line and when I heard that the line was organising a ‘Multiple Memories Weekend’, the first day of which was a photographer’s theme day, I was quickly online booking a place. Iris the Railcar stands in the newly re-opened Shuttle station. The photographer’s day took place on Friday 8th August 2014 and featured a yard tour, runs down the line with various units, stops at interesting points along the line for trackside photos, and an evening photo shoot in the depot. The chance to get some shots in unusual locations was too good to miss, and came at the bargain price of £49.50. The event started with a safety brief, followed by a yard tour, featuring carriages under restoration, the DMU sheds and the steam sheds. The railways diesel engines and shunter were also on display. After the tour unit M79900, the former test car ‘Iris’, was waiting in Wirksworth station for a run down to Duffield. Stops were made at Hannages, an official British Railways photo point, and Roland Crossing, where long-range shots were possible. Stops were also made at Idridgehay and Shottle where scenes from bygone days were recreated. These featured milk churns and mail sacks being loaded into a van attached to ‘Iris’. 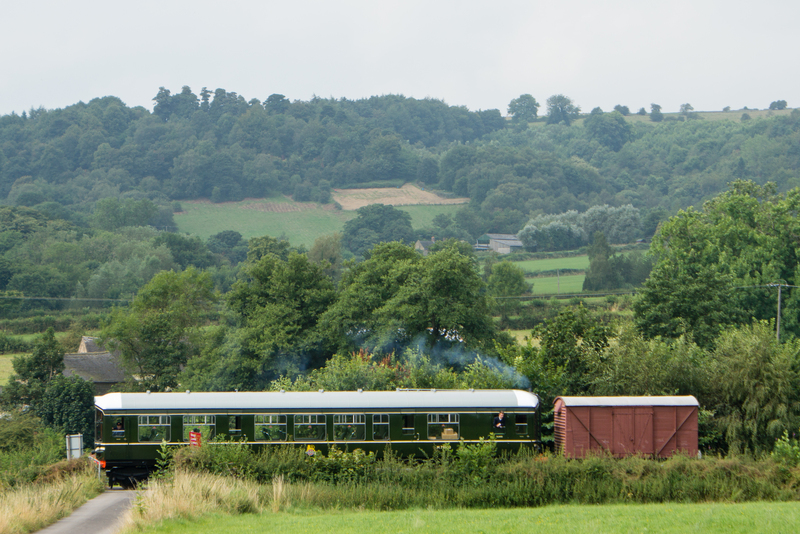 At Duffield, the van was shunted into a loop and the unit made its way back up the line to Wirksworth non-stop. Iris and brake van passing Roland Crossing. W55006 stands in a rainy Shuttle station. The station opened at the same time as all the others on the line in 1867 as Cower’s Lane. The name was changed to Shottle on request of the owner of nearby Shottle Hall. At its peak in the 1920s, Shottle Station handled about 12,000 passengers a year, and over 1,000 tons of minerals and goods such as coal, coke and limestone, much of the coal being sent to Ashbourne. Grain, beet pulp and agricultural fertilizer were also handled. Regular passenger services ceased in 1947, but the station continued in use for excursions and special passenger trains, as well as for minerals and goods until 1964, when the service finally ended. The station building and cottages are private. After lunch in the station Pullman buffet, unit 55006 took over for more of the same, collecting the van from Duffield and bringing it back to Wirksworth. On return, M79900 was ready to take us on the short trip up the Ravenstor branch where more photo opportunities were awaiting. M79900 Iris stands at Ravenstor halt. After a tea break, and the opportunity to photograph 55006 and 79900 in Wirksworth station, a three car unit consisting of 51505, 59303 and 51073 was waiting to run down to Duffield. This unit re-created the days when the Gatwick Express was made up of these units, and photographers were able to re-create scenes from this era. DMUs stand outside Wirksworth depot at the end of the day. Finally, as darkness fell, night-time shots were taken in the depot, featuring engines running with their lights on. Although this took a while to set-up as we waited for darkness, it was a fitting end to a long, and very enjoyable day. Memories of the multiples will stay with me for the rest of my life, through the lens of my camera.